Field staff have different possibilities of getting more customers and achieving a higher turnover. An important aspect is good route planning: Which customers shall be visited on which days and in which order? Currently many sales reps and field staff still either drive “chaotically” to any customer who raised their attention or make the effort of always planning their daily, weekly or monthly tours manually. The first is ineffective, the latter is time-consuming and makes it difficult to achieve all your targets. Unnecessary kilometres are often the consequence. Nowadays there exists advanced software for route planning that automates the entire process. A computer can both calculate your routes quicker and achieve better results. Learn from this article how to get started with automatic route planning. Are all customers included or are some missing? Does the file include inactive customers who no longer need to be visited? Are there erroneous duplicates – e.g. customers’ invoice addresses vs. delivery addresses? Apart from the address, does the file contain all customer information that is of importance for the scheduling of visits, e.g. contact persons, telephone numbers or opening hours? Have you entered a customer classification (e.g. A/B/C) as a basis for the frequency of visits – e.g. A for weekly visits, B for monthly visits, C for annual visits? Only in very rare cases it is advisable to visit all customers using the same interval. Does the file even contain the information when you last visited the customer? The next step is to import the prepared customer file into the route planning software. 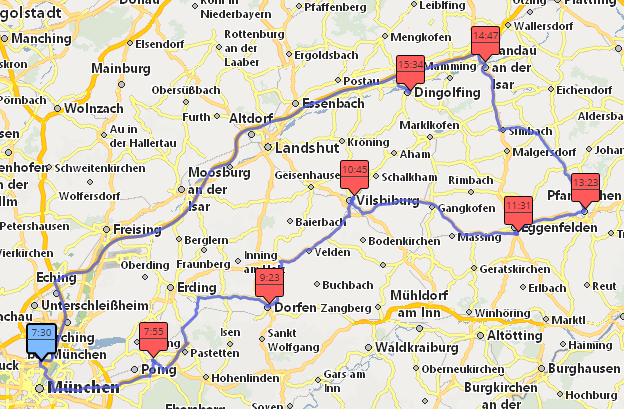 During the import process all customer addresses are automatically localized on the map (technical term: “geocoded”). As a result you get an overview of all customers on a map. This is the crucial point: Formerly you had to find out by yourself which customers you would like to visit on which day. Hopefully you based your decisions on the priority of your customers (“Which customer is important? Which have not been visited for a long time?”). Also you should have planned to visit nearby customers on the same day, if possible. It is not easy to reconcile so many details. A modern route planner does all this for you: You simply define how often you want to visit individual customers (visiting frequency or visiting interval) and the software automatically selects the customers who should ideally be visited on a certain day. During this process the software automatically identifies which customers are near to each other and can be visited in one go and thus creates efficient and mileage-optimized routes for each day. However, during this task the wheat of route optimization programs is separated from the chaff. Whilst most electronic route planners on the market manage to create the right order for a single day for a maximum of 8 to 25 selected customers, the fully automatic creation of optimized routes for an entire week or even more is only provided by the cream of the top of route planners. portatour® is an example of one of these leading route planners, creating an optimized route plan for several days or weeks at the push of a button whilst taking into account all general requirements – e.g. opening hours of your customers or fixed appointments in your calendar. This makes route planning a walk in the park. Hint: register for the the 30 day free trial! Once you have switched from manual to automatic route planning a series of further optimization potentials open up. Subscribe to our Blog to learn more.